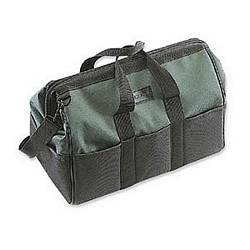 Open Top Tool Bags Make Access to Tools Quick and Easy! Pros: This toolkit is big enough to carry enough tools to get the job done, with room to also carry a power supply, spare cables, adapters, and other nifty stuff to keep you from having to go back to the office. Cons: Unfortunately, the fabric around the d-rings for the shoulder strap is not very strong. I've gone thru two of these bags now, and I'm not going to buy another because they tear with all the weight that I put into the bag. Other Thoughts: Reinforce the ends of the zipper, heavy duty the carrying strap connectors, this would be an awesome bag. It's ok if you don't put more than 20 pounds in it. My rig goes about 50 some days.